This week the group were able to complete their designs and share their very important messages with the class. We talked about why our messages are very important and what we hoped could happen to make our ideas a reality. The CP Investigators then discussed their thoughts and ideas about the project so far, in readiness for meeting their Headteacher next week…The group used the questions on this sheet to reflect on the project and think about how they would share their work and findings with others. After spending time creating their designs and deciding upon important messages. The CP Investigator groups have been thinking more about empathy and why it is important to express our opinions and share our experiences with others. Have a conversation with your group about sharing and listening, let us know your ideas in the comments below. This week the Children’s Parliament Investigators reflected on their design solutions and selected a message to make into a graphic communication. 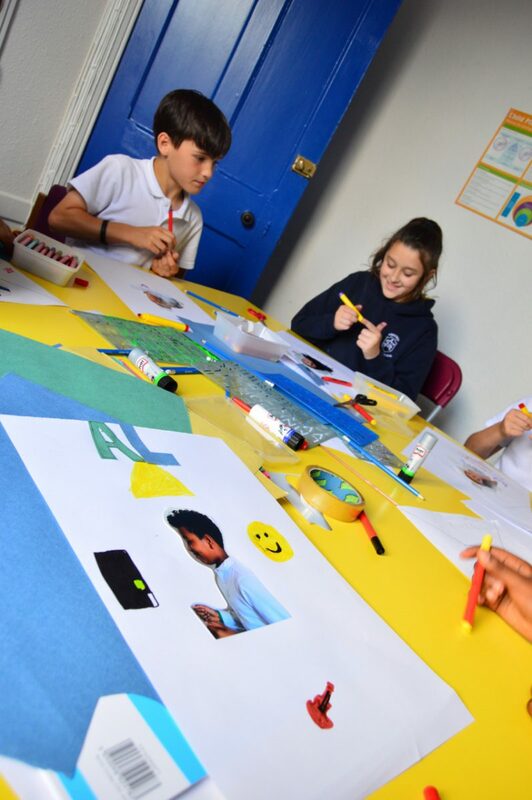 Using collaged paper, pens and tape the investigators created striking images that communicate their feelings around the themes discussed within the Children’s Parliament Investigates Bullying project. 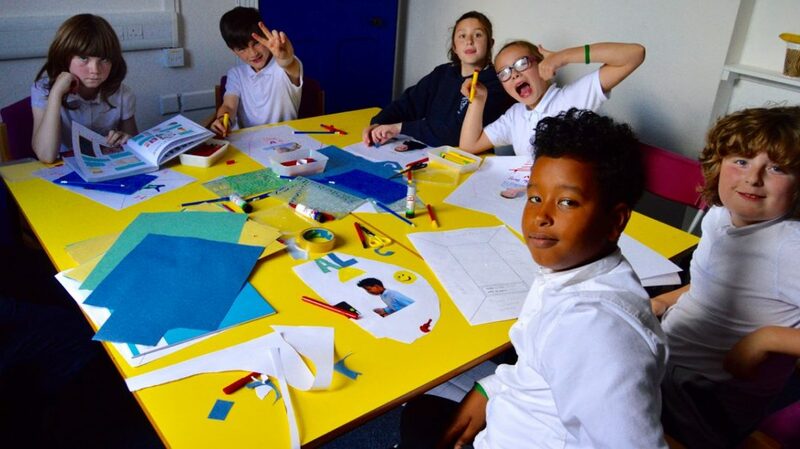 In this meeting, our Children’s Parliament investigators were introduced to some of the ideas behind graphic design. By exploring the visual elements and practicing their eye-for-design, the Investigators began to create a better solution to their Design Brief. 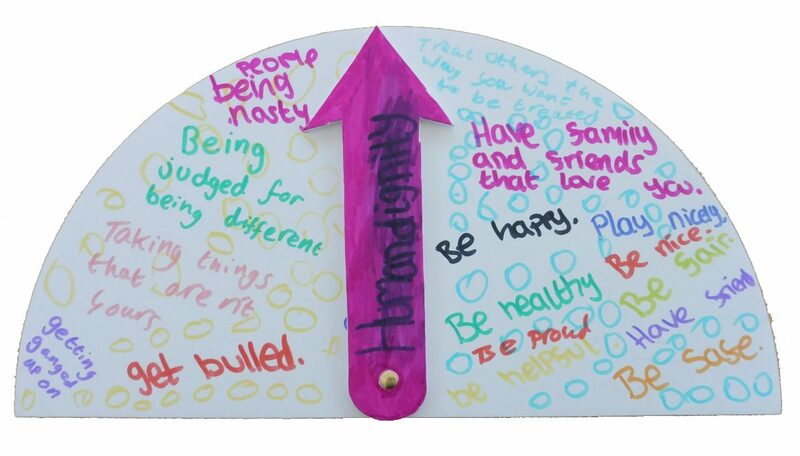 Create a poster that will inspire and help others to make your school a happy, safe and friendly place to be. Your poster should include an inspirational message and you will use the visual elements to make your poster feel positive and eye-catching. In this session the CP Investigators were asked to think about 5 adults they would talk to about being bullied; what do those adults need to THINK, FEEL & DO to help and what might adults THINK, FEEL & DO which may be unhelpful to them? This week the CP investigators discussed how adults should respond when children ask for help and support with bullying. Some of the CP Investigators thought that children shouldn’t have to prove that they are not “telling tales” before adults act on their behalf. Other CP Investigators thought that adults shouldn’t “just believe” children, but investigate the situation so that everyone was fairly treated. How do you think adults should respond for children who report a bullying incident? Discuss with your group/class and let us know your ideas by leaving a comment at the bottom of the page. 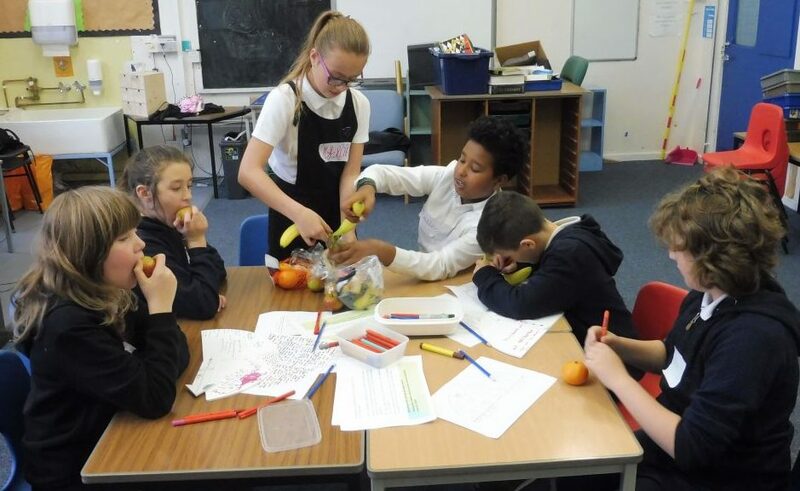 In the fourth meeting of Children’s Parliament Investigates… the investigators explored the concept of empathy through hearing about a young boy named Sandy. Empathy is when you are able to see things from somebody else’s perspective. By putting ourselves in others’ shoes and feeling what someone else is feeling, we can better understand how our choices impact on other people. 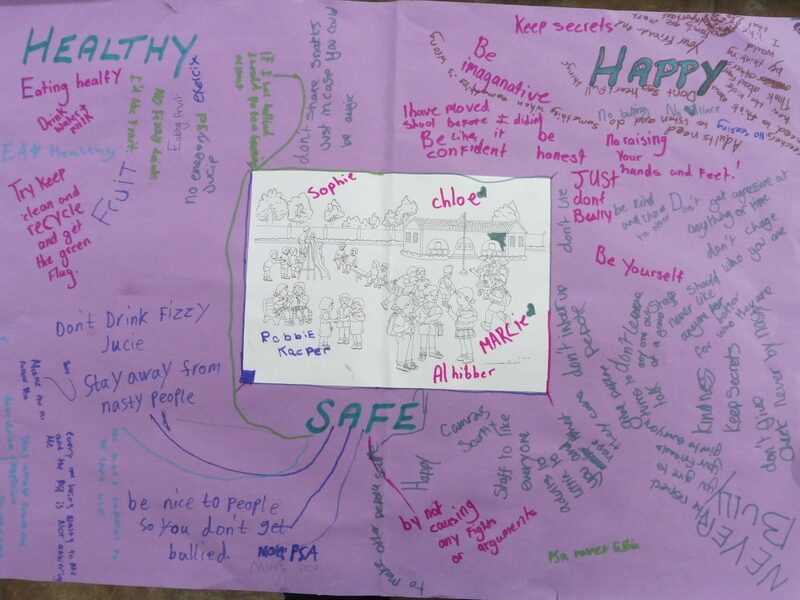 In our second team meeting at Abbeyhill we discussed and explored together what we think is needed to make a Healthy – Happy – Safe school. We thought about our journey to school, our time in the classroom and our time in the playground. In our team we discussed how we have all had different experiences in school and if we were worried or concerned about something we had someone who we could speak to. What was important to us was our past experiences of and relationship with the adult we chose to speak to. We need adults to be kind, to have the time to listen and to make bullying stop when it happens. We also discussed how feeling safe and feeling happy are closely connected and how when we argue with each other we feel frustrated, angry and sad. What do you want adults to do to support children who are concerned about bullying? What do you think is needed to make school a healthy-happy-safe space for everyone? Graeme and Ross from Children’s Parliament (CP) visited today to begin work with our 6 new Children’s Parliament Investigators (names from each school) on our CP Investigates Bullying Project. Our first team meeting was about getting to know each other, being curious and asking questions about the project and discussing how we will work with each other as a team. We thought about and discussed some of the most important things that we need to make a world that is healthy – happy and safe for us and for all children. 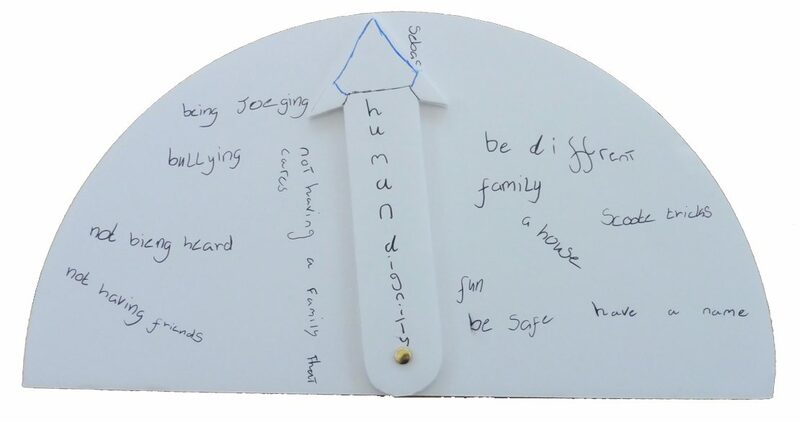 We hope that other members of our school community, Head teacher, teachers, PSA’s and our classmates will join us here on our blog and we welcome all of your comments and suggestions on the work that we are doing and how together we can create a safe space to learn and be the best that we can be. Now that the water is running again(!) the sessions can continue uninterrupted – I’m looking forward to hearing what everyone says in response to your questions. 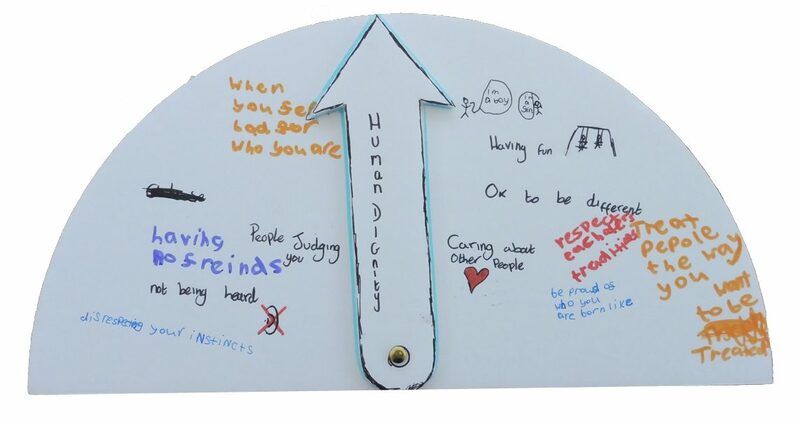 Today we discused with our classmates what we felt adults could do to support children who were being bullied. There was a general feeling that adults are resposible for making sure children are safe and that it is important that we feel supported and believed. Most of us felt that bullies should be punished (e.g.detention) but that those children with issues should also get help. We agreed that parents had a responsibility in supporting children too by monitoring them at home to make sure they are using social media appropriately and safely. To make the school a safer place a number of us said there should be more PSAs out in the playground. It was also suggested that hidden security cameras in the classrooms which parents could watch would also help to stop bullying. We said that if the school is a happy place and everyone is made to feel equal then we are more likely to be kind to each other. These are really interesting thoughts everyone, especially about social media and the effect that it can have on how we all behave towards each other in school. Make sure you discuss this with the rest of the class and there will be an opportunity to share your thoughts at assembly coming up soon. “An adult should deal with it and actually do something” – Kacper. Thanks for letting us know, great to hear some views from other children in the class too. Please let us know if you have any more conversations that link to the project themes, we are keen to hear as many views as possible.